Commission Regulation (EC) No 1235/2008 (2) lays down detailed rules for imports of organic products from third countries. A period for the control bodies and control authorities to submit their request for recognition for the purpose of compliance in accordance with Article 32 of Regulation (EC) No 834/2007 is provided for in Regulation (EC) No 1235/2008. As the implementation of the provisions regarding the import of compliant products is still under assessment and the related guidelines, models, questionnaires and the necessary electronic transmission system are still under development, the deadline for the submission of requests by control bodies and control authorities should be extended. Experience has shown diverging practices in Member States as regards the verification of the consignments of organic products prior to their release for free circulation into the Union. For the sake of consistent and effective controls, the types of checks necessary for the verification of the consignments should be clarified, in the light of the risk assessment to be carried out in accordance with Article 27(3) of Regulation (EC) No 834/2007. It is also appropriate to reword the definition of the authorities responsible for the verification of the consignments and the endorsement of the certificates of inspection in order to clarify that those authorities are a competent authority responsible for the organisation of official controls in the field of organic production and designated pursuant to Article 27(1) of Regulation (EC) No 834/2007. Diverging practices by control bodies and control authorities have also been observed as regards the classification of products to be imported under the product categories referred to in Annexes III and IV to Regulation (EC) No 1235/2008. For a more uniform classification under those product categories certain definitions should therefore be laid down in the interest of clarity and legal certainty for operators, to ensure uniform implementation of the rules by the control bodies and control authorities, and to facilitate supervision by the competent authorities. For product categories referring to unprocessed or processed, those terms should have the same meaning as in the definitions of processed and unprocessed products in Regulation (EC) No 852/2004 of the European Parliament and of the Council (3) with a view to simplification and consistency with the hygiene rules. However, it should be clarified that labelling and packaging operations are irrelevant for the qualification of the product as unprocessed or processed. The two import schemes provided for in Article 33(2) and (3) of Regulation (EC) No 834/2007 are, in principle, mutually exclusive. If a third country is recognised as equivalent in accordance with Article 33(2) of Regulation (EC) No 834/2007, there is no need to recognise a control authority or control body for that country in accordance with Article 33(3). As a consequence, Article 10(2)(b) of Regulation (EC) No 1235/2008 provides that a control authority or control body can only be recognised in accordance with Article 33(3) of Regulation (EC) No 834/2007 for a country that is not recognised in accordance with Article 33(2) of Regulation (EC) No 834/2007. However, in order to avoid any barrier to imports for organic products, it should be possible for control bodies or control authorities to be recognised for a recognised third country where the recognition of that third country does not cover the product to be imported. The existing derogation in Article 10(3) of Regulation (EC) No 1235/2008 should therefore be reworded to take into account the practice in place by referring to products rather than to the category of products. On the basis of Regulation (EC) No 834/2007 products imported from a third country may be placed on the Union market as organic if they, in particular, are covered by a certificate of inspection issued by the competent authorities, control authorities or control bodies of a recognised third country or by a recognised control authority or control body. In accordance with Action 12 of the Action Plan for the Future of Organic Production in the European Union (4) the Commission has developed a system of electronic certification for imports of organic products, as a module integrated into the electronic Trade Control and Expert System (TRACES) provided for in Commission Decision 2003/24/EC (5). Certain provisions of Regulation (EC) No 1235/2008 need to be amended in order to introduce the electronic certification system and to ensure the proper functioning of that system. Therefore, the rules for the release for free circulation by the relevant Member State's customs authority and the workflow for the issuing and endorsing of the certificate of inspection, including the verification of the link between the certificate of inspection and the customs declaration, should be clarified. In this context, the workflow for the issue and endorsement of the certificate of inspection under special customs procedures should also be clarified. For the proper functioning of the electronic system, it is appropriate to refer to email addresses of recognised control bodies and control authorities. In order to ensure the integrity of the organic products imported into the Union, it is necessary to clarify that, as a general rule, the control body or control authority issuing the certificate of inspection is the control body or authority certifying the producer or the processor of the product. In case the operator carrying out the last operation for the purposes of preparation as defined in Article 2(i) of Regulation (EC) No 834/2007 is different from the original producer or processor of the product, the certificate of inspection should be issued by the control body or control authority having checked the last operation. Furthermore, it is necessary to clarify that control bodies or control authorities listed in Annex III to Regulation (EC) No 1235/2008 may only issue certificates of inspection according to the terms of their recognition, while those listed in Annex IV to that Regulation may only issue certificates of inspections for the products and origins for which they are listed for. Experience has shown diverging practices as regards checks to be carried out by the control body or control authority issuing the certificate of inspection. Therefore, it is necessary to specify the checks to be carried out prior to issuing the certificate. Control bodies or control authorities should only issue the certificate of inspection after full documentary checks and, as appropriate according to their risk assessment, physical checks of the products concerned. For processed agricultural products, control bodies and control authorities listed in Annex III to Regulation (EC) No 1235/2008 should check that all their ingredients have been submitted to a control system in accordance with the terms of recognition of the relevant third country, while control bodies and control authorities listed in Annex IV to that Regulation should check that ingredients have been controlled and certified by control bodies or control authorities recognised in accordance with Union legislation or produced in the Union. Similarly it is necessary to specify the checks to be carried out by control bodies or control authorities listed in Annex IV to Regulation (EC) No 1235/2008 that certify operators in the final stages of the production chain, such as those only carrying out labelling or packaging operations. In such cases, it should be verified that the products concerned have been controlled and certified by control bodies or control authorities listed in that Annex and recognised for the relevant country and product category. The authorities responsible for granting and updating the rights to access TRACES for the purpose of electronic certification of inspection should be identified. In addition, rules should be laid down to ensure that TRACES guarantees the authenticity, integrity and legibility over time of the information and the associated metadata throughout the period for which they are required to be kept. Provision should also be made for an effective and efficient exchange of information between Member States' authorities in cases of irregularities detected, in particular where products are labelled as organic, but are not accompanied by a certificate of inspection. As the last import authorisations issued by Member States expired on 30 June 2015, any reference to import authorisations should be deleted from Regulation (EC) No 1235/2008. Operators and Member States should have time to adapt their procedures to the electronic certificate of inspection provided by TRACES. Therefore it is necessary to provide for a transitional period in which the issue and endorsement of the certificate of inspection in paper form is still possible. For the sake of ensuring the proper functioning of the electronic certificate of inspection, and in particular to clarify that in-conversion products are excluded from the recognitions granted to third countries, to harmonise the wording regarding the origin of products coming from recognised third countries and to change product category C to cover algae, including micro-algae, it is appropriate to amend certain elements of Annexes III and IV to Regulation (EC) No 1235/2008 without changing the scope of the recognitions previously granted to third countries or to control bodies and control authorities. According to the information provided by the United States, the treatment with antibiotics of apples and pears to control fire blight is not allowed in that third country since October 2014. Therefore, it is justified to remove the relevant limitation for product categories A and D from Annex III to Regulation (EC) No 1235/2008. In the light of the experience gained with the implementation of the equivalence system, it is necessary to adapt the model of the certificate of inspection and extracts thereof as set out in Annexes V and VI to Regulation (EC) No 1235/2008, in order to provide information on the producer or processor of the product, as well as on the relevant country of origin, when different from the country of export of the product. Commission Regulation (EC) No 889/2008 (6) lays down detailed rules relating to organic production, labelling and control. As the new definitions of ‘processed’ and ‘unprocessed’ inserted in Regulation (EC) No 1235/2008 would imply that some of the operations included in the definition of preparation in Article 2(i) of Regulation (EC) No 834/2007 are not to be considered as entailing processing, the rules set out in Article 26 of Regulation (EC) No 889/2008 for the production of processed food and feed would become unclear. Therefore, the rules on the precautionary measures to be taken to avoid the risk of contamination by unauthorised substances or products or mixtures or exchanges with non-organic products should be reworded to make clear that they apply, as appropriate, to operators carrying out preserving activities. For that purpose, it is also appropriate to include definitions of the terms ‘preserving’ and ‘processing’. The transmission of information on imported consignments in accordance with Regulation (EC) No 889/2008 should also be done through TRACES. A proper functioning of the electronic certification system requires that the information to be notified by the Member States to the Commission on the competent authorities and control bodies or control authorities includes e-mails addresses and internet websites. It is appropriate to set a new ultimate date for the notification of that information. Regulations (EC) No 1235/2008 and (EC) No 889/2008 should therefore be amended accordingly. In order to ensure a smooth transition to the new electronic certification system, this Regulation should apply from a date which is six months after its publication. However, the amendment of product category C to cover algae, including micro-algae, should apply from the date of application of the relevant provision of Commission Implementing Regulation (EU) 2016/673 (7) amending Regulation (EC) No 889/2008 to allow the use of micro-algae for food. (*) Regulation (EC) No 882/2004 of the European Parliament and of the Council of 29 April 2004 on official controls performed to ensure the verification of compliance with feed and food law, animal health and animal welfare rules (OJ L 165, 30.4.2004, p. 1).’;"
“point of entry”: means the point of release for free circulation. (**) Regulation (EU) No 1380/2013 of the European Parliament and of the Council of 11 December 2013 on the Common Fisheries Policy, amending Council Regulations (EC) No 1954/2003 and (EC) No 1224/2009 and repealing Council Regulations (EC) No 2371/2002 and (EC) No 639/2004 and Council Decision 2004/585/EC (OJ L 354, 28.12.2013, p. 22)." (***) Regulation (EC) No 852/2004 of the European Parliament and of the Council of 29 April 2004 on the hygiene of foodstuffs (OJ L 139, 30.4.2004, p. 1).’;"
the indication of the number of the certificate of inspection in the customs declaration for release for free circulation as referred to in Article 158(1) of Regulation (EU) No 952/2013 of the European Parliament and of the Council (****). The verification of the consignment and the endorsement of the certificate of inspection shall be carried out by the relevant Member State's competent authority in that Member State where the consignment is released for free circulation in the Union. Member States shall designate the points of entry in their territory and inform the Commission of the designated points of entry. 2. The certificate of inspection shall be issued by the relevant control authority or control body, endorsed by the relevant Member State's competent authority and completed by the first consignee on the basis of the model and the notes set out in Annex V and using the electronic Trade Control and Expert System (TRACES) established by Commission Decision 2003/24/EC (*****). The original certificate of inspection shall be a printed and hand-signed copy of the completed electronic certificate in TRACES or, alternatively, a certificate of inspection signed in TRACES with an advanced electronic signature within the meaning of Article 3(11) of Regulation (EU) No 910/2014 of the European Parliament and of the Council (******) or with an electronic signature offering equivalent assurances with regard to the functionalities attributed to a signature by applying the same rules and conditions as those laid down in the Commission's provisions on electronic and digitised documents, set out in the Annex to Commission Decision 2004/563/EC, Euratom (*******). When the original certificate of inspection is a printed and hand-signed copy of the completed electronic certificate in TRACES, control authorities, control bodies, relevant Member State's competent authorities and the first consignee shall verify at each stage of issuing, endorsement and reception of the certificate of inspection that this copy corresponds to the information indicated in TRACES. 3. To be accepted for endorsement, the certificate of inspection shall have been issued by the control authority or control body of the producer or the processor of the product concerned or, where the operator carrying out the last operation for the purposes of preparation is different from the producer or processor of the product, by the control authority or control body of the operator carrying out the last operation for the purposes of preparation as defined in Article 2(i) of Regulation (EC) No 834/2007. a control authority or control body listed in Annex IV to this Regulation for the products concerned and for the third country in which the products have their origin or in which the last operation for the purposes of preparation has been carried out. 4. The control authority or control body issuing the certificate of inspection shall only issue the certificate of inspection and sign the declaration in box 18 of the certificate after it has carried out a documentary check on the basis of all relevant inspection documents, including in particular the production plan for the product concerned, transport documents and commercial documents and, as appropriate according to its risk assessment, it has carried out a physical check of the consignment. However, for processed products, if the control authority or control body issuing the certificate of inspection is a control authority or control body listed in Annex III, it shall only issue the certificate of inspection and sign the declaration in box 18 of the certificate after it has verified that all organic ingredients of the product have been controlled and certified by a control authority or control body recognised by the third country concerned listed in that Annex, or if the issuing control authority or control body is a control authority or control body listed in Annex IV, it shall only issue the certificate of inspection and sign the declaration in box 18 of the certificate after it has verified that all organic ingredients of such products have been controlled and certified by a control authority or control body listed in Annex III or IV or have been produced and certified in the Union in accordance with Regulation (EC) No 834/2007. Where the operator carrying out the last operation for the purposes of preparation is different from the producer or processor of the product, the control authority or control body issuing the certificate of inspection and listed in Annex IV shall only issue the certificate of inspection and sign the declaration in box 18 of the certificate after it has carried out a documentary check on the basis of all relevant inspection documents, including transport documents and commercial documents, it has verified that the production or the processing of the product concerned has been controlled and certified by a control body or control authority recognised for the products concerned and the country concerned in accordance with Article 33(3) of Regulation (EC) No 834/2007 and it has carried out, as appropriate according to its risk assessment, a physical check of the consignment. At the request of the Commission or of the competent authority of a Member State, the control authority or control body issuing the certificate of inspection in accordance with the second and third subparagraphs shall make available without delay the list of all operators in the organic production chain and the control authorities or control bodies under whose control those operators have placed their operations. 5. The certificate of inspection shall be made in one single original. The first consignee or, where relevant, the importer may make a copy of the certificate of inspection for the purpose of informing the control authorities and control bodies in accordance with Article 83 of Regulation (EC) No 889/2008. Any such copy shall carry the indication “COPY” printed or stamped thereon. 6. At the verification of a consignment, the relevant Member State's competent authority shall endorse the original certificate of inspection in box 20 and shall return it to the person who submitted the certificate. 7. The first consignee shall, at the reception of the consignment, complete box 21 of the certificate of inspection, to certify that the reception of the consignment has been carried out in accordance with Article 34 of Regulation (EC) No 889/2008. The first consignee shall then send the original of the certificate to the importer mentioned in box 11 of the certificate for the purposes of the second subparagraph of Article 33(1) of Regulation (EC) No 834/2007. (****) Regulation (EU) No 952/2013 of the European Parliament and of the Council of 9 October 2013 laying down the Union Customs Code (OJ L 269, 10.10.2013, p. 1)." (*****) Commission Decision 2003/24/EC of 30 December 2002 concerning the development of an integrated computerised veterinary system (OJ L 8, 14.1.2003, p. 44)." (******) Regulation (EU) No 910/2014 of the European Parliament and of the Council of 23 July 2014 on electronic identification and trust services for electronic transactions in the internal market and repealing Directive 1999/93/EC (OJ L 257, 28.8.2014, p. 73)." (*******) Commission Decision 2004/563/EC, Euratom of 7 July 2004 amending its Rules of Procedure (OJ L 251, 27.7.2004, p. 9).’;"
1. In cases of force majeure or exceptional circumstances preventing the electronic system from working, and in particular of malfunctioning of the system or a lack of a lasting connection, certificates of inspection and their extracts may be issued and endorsed pursuant to Article 13(3) to (7) without using TRACES in accordance with paragraphs 2, 3 and 4 of this Article, and on the basis of the models and the notes set out in Annex V or VI. The competent authorities, control authorities, control bodies and operators shall inform the Commission without delay and shall insert in TRACES all the necessary details within ten calendar days following the re-establishment of the system. 2. When the certificate of inspection is issued without using TRACES, it shall be drawn up in one of the official languages of the Union and filled in, except for the stamps and signatures, either entirely in capital letters or entirely in typescript. The certificate of inspection shall be in the official language or one of the official languages of the Member State of clearance. Where necessary, the relevant Member State's competent authorities may request a translation of the certificate of inspection into its official language or one of its official languages. Uncertified alterations or erasures shall invalidate the certificate. 3. The control authority or control body issuing the certificate of inspection shall give a serial number to each issued certificate and keep a register of the issued certificates in chronological order and make the correspondence afterward with the serial number given by TRACES. 4. Where the certificate of inspection is issued and endorsed without using TRACES, the second and third subparagraphs of Article 15(1) and Article 15(5) shall not apply. The importer shall indicate the number of the certificate of inspection in the customs declaration for release for free circulation as referred to in Article 158(1) of Regulation (EU) No 952/2013. The Commission shall be in charge of granting and updating access rights to TRACES of the competent authorities as defined in Article 2(n) of Regulation (EC) No 834/2007, of competent authorities of third countries recognised in accordance with Article 33(2) of that Regulation and of control authorities and control bodies listed in Annex III or IV to this Regulation. Before granting access rights to TRACES, the Commission shall verify the identity of the competent authorities, control authorities and control bodies concerned. The competent authorities as defined in Article 2(n) of Regulation (EC) No 834/2007 shall be in charge of granting and updating access rights to TRACES of operators, control authorities and control bodies in the Union. Before granting access rights to TRACES, the competent authorities shall verify the identity of the operators, control authorities and control bodies concerned. Member States shall designate a single authority responsible to coordinate the cooperation and the contacts with the Commission in this area. The competent authorities shall communicate the granted access rights to the Commission. The Commission shall activate those access rights in TRACES. TRACES shall protect the integrity of the information encoded in accordance with this Regulation. ‘1. 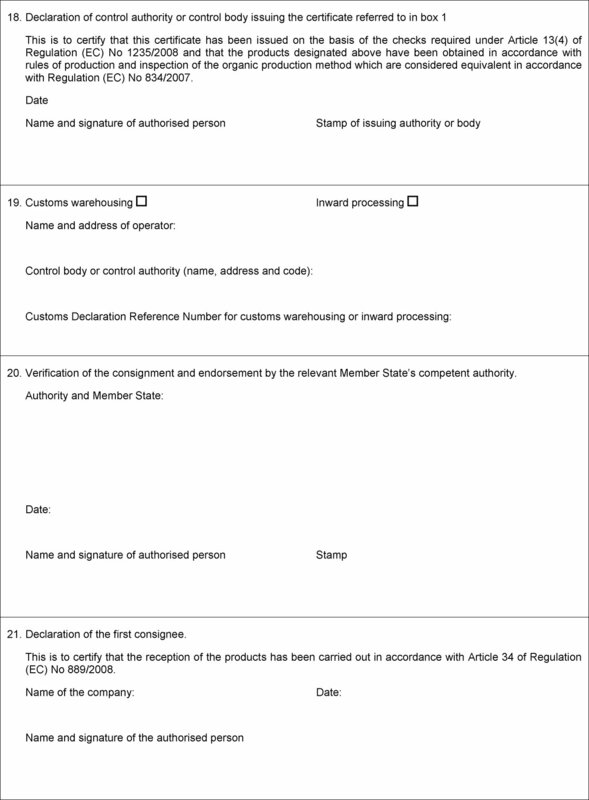 Where a consignment coming from a third country is placed under customs warehousing or inward processing as provided for in Regulation (EU) No 952/2013, and subject to one or more preparations as referred to in the second subparagraph, the relevant Member State's competent authority shall carry out the verification of the consignment as referred to in point (b) of the first subparagraph of Article 13(1) of this Regulation before the first preparation is carried out. The reference number of the customs declaration by which the goods have been declared for customs warehousing or for inward processing procedure shall be indicated in box 19 of the certificate of inspection. labelling concerning the presentation of the organic production method. After this preparation, the consignment shall be subject, before the release for free circulation, to the measures referred to in Article 13(1) of this Regulation. ‘When the verification of a consignment by a relevant Member State's competent authority leads to the detection of an infringement or an irregularity that leads to the refusal of the endorsement of the certificate and of the release for free circulation of products, that authority shall without delay notify that infringement or irregularity to the Commission and to the other Member States through TRACES. ‘The first list of recognised countries shall include Argentina, Australia, Costa Rica, India, Israel (********), New Zealand and Switzerland. It shall not contain the code numbers referred to in Article 7(2)(f) of this Regulation. These code numbers shall be added before 1 July 2010 by updating the list in accordance with Article 17(2). (********) Hereafter understood as the State of Israel, excluding the territories under Israeli administration since June 1967, namely the Golan Heights, the Gaza Strip, East Jerusalem and the rest of the West Bank.’;"
Annex VI is replaced by the text set out in Annex III to this Regulation. “processing” means any action referred to in point (m) of Article 2(1) of Regulation (EC) No 852/2004, including the use of substances referred to in Article 19(2)(b) of Regulation (EC) No 834/2007. Packaging or labelling operations shall not be considered as processing. (*********) Regulation (EC) No 852/2004 of the European Parliament and of the Council of 29 April 2004 on the hygiene of foodstuffs (OJ L 139, 30.4.2004, p. 1).’;"
1. Operators preserving products or producing processed feed or food shall establish and update appropriate procedures based on a systematic identification of critical processing steps. The application of those procedures shall guarantee at all times that preserved or processed products comply with the organic production rules. ‘The importer shall transmit the information referred to in the first and second paragraphs by using the electronic Trade Control and Expert System (TRACES) established by Commission Decision 2003/24/EC (**********). (**********) Commission Decision 2003/24/EC of 30 December 2002 concerning the development of an integrated computerised veterinary system (OJ L 8, 14.1.2003, p. 44).’;"
by 30 June 2017, the name, address, email address and internet address of the relevant Member State's competent authorities as defined in point (6) of Article 2 of Regulation (EC) No 1235/2008, and afterwards any changes thereto.’. It shall apply from 19 April 2017. However, point (2) of Article 1 shall apply from the date of entry into force of this Regulation and point (15) of Article 1 shall apply from 7 May 2017. Done at Brussels, 14 October 2016. (5) Commission Decision 2003/24/EC of 30 December 2002 concerning the development of an integrated computerised veterinary system (OJ L 8, 14.1.2003, p. 44). (6) Commission Regulation (EC) No 889/2008 of 5 September 2008 laying down detailed rules for the implementation of Council Regulation (EC) No 834/2007 on organic production and labelling of organic products with regard to organic production, labelling and control (OJ L 250, 18.9.2008, p. 1). (7) Commission Implementing Regulation (EU) 2016/673 of 29 April 2016 amending Regulation (EC) No 889/2008 laying down detailed rules for the implementation of Council Regulation (EC) No 834/2007 on organic production and labelling of organic products with regard to organic production, labelling and control (OJ L 116, 30.4.2016, p. 8). or from a third country for which the Republic of Korea has recognised that the products have been produced and controlled in that third country in accordance with the rules equivalent to those laid down in the legislation of the Republic of Korea.’. This is to certify that this certificate has been issued on the basis of the checks required under Article 13(4) of Regulation (EC) No 1235/2008 and that the products designated above have been obtained in accordance with rules of production and inspection of the organic production method which are considered equivalent in accordance with Regulation (EC) No 834/2007. 20. Verification of the consignment and endorsement by the relevant Member State’s competent authority. 21. Declaration of the first consignee. This is to certify that the reception of the products has been carried out in accordance with Article 34 of Regulation (EC) No 889/2008. Box 1: Name, address and code of control body or authority in the third country as referred to in Article 13(3) of Regulation (EC) No 1235/2008. This body also completes boxes 4 to 18. Box 2: This box indicates the provisions of Regulation (EC) No 834/2007 which are relevant for the issue and use of this certificate; indicate the relevant provision. 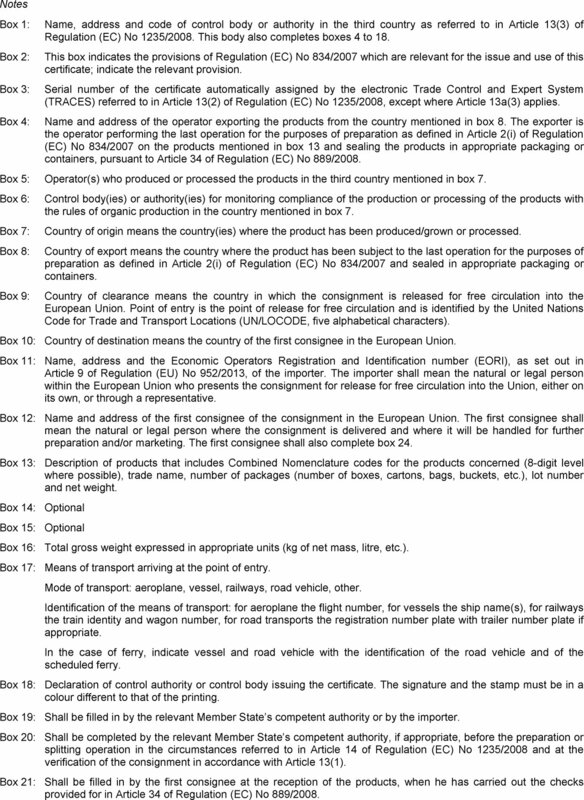 Box 3: Serial number of the certificate automatically assigned by the electronic Trade Control and Expert System (TRACES) referred to in Article 13(2) of Regulation (EC) No 1235/2008, except where Article 13a(3) applies. Box 4: Name and address of the operator exporting the products from the country mentioned in box 8. The exporter is the operator performing the last operation for the purposes of preparation as defined in Article 2(i) of Regulation (EC) No 834/2007 on the products mentioned in box 13 and sealing the products in appropriate packaging or containers, pursuant to Article 34 of Regulation (EC) No 889/2008. Box 5: Operator(s) who produced or processed the products in the third country mentioned in box 7. Box 6: Control body(ies) or authority(ies) for monitoring compliance of the production or processing of the products with the rules of organic production in the country mentioned in box 7. Box 7: Country of origin means the country(ies) where the product has been produced/grown or processed. Box 8: Country of export means the country where the product has been subject to the last operation for the purposes of preparation as defined in Article 2(i) of Regulation (EC) No 834/2007 and sealed in appropriate packaging or containers. Box 9: Country of clearance means the country in which the consignment is released for free circulation into the European Union. Point of entry is the point of release for free circulation and is identified by the United Nations Code for Trade and Transport Locations (UN/LOCODE, five alphabetical characters). Box 10: Country of destination means the country of the first consignee in the European Union. 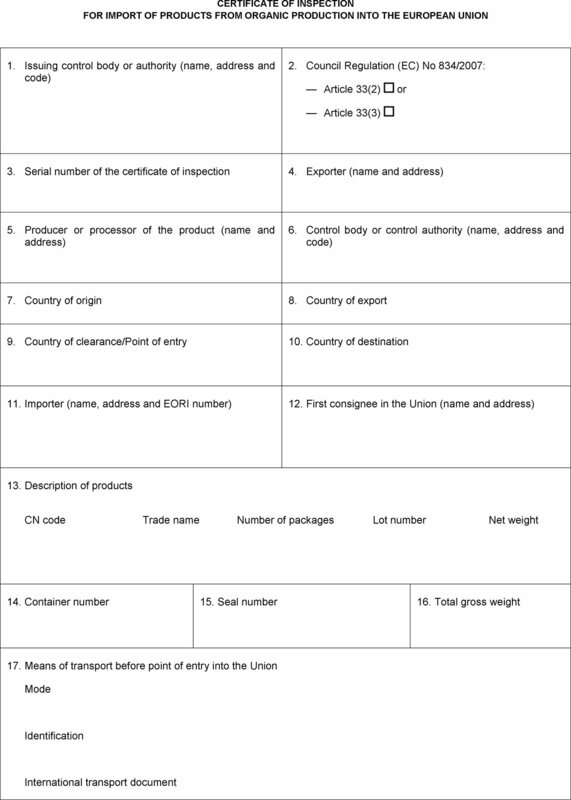 Box 11: Name, address and the Economic Operators Registration and Identification number (EORI), as set out in Article 9 of Regulation (EU) No 952/2013, of the importer. The importer shall mean the natural or legal person within the European Union who presents the consignment for release for free circulation into the Union, either on its own, or through a representative. Box 12: Name and address of the first consignee of the consignment in the European Union. The first consignee shall mean the natural or legal person where the consignment is delivered and where it will be handled for further preparation and/or marketing. The first consignee shall also complete box 24. Box 13: Description of products that includes Combined Nomenclature codes for the products concerned (8-digit level where possible), trade name, number of packages (number of boxes, cartons, bags, buckets, etc. ), lot number and net weight. Box 16: Total gross weight expressed in appropriate units (kg of net mass, litre, etc.). Box 17: Means of transport arriving at the point of entry. Mode of transport: aeroplane, vessel, railways, road vehicle, other. Identification of the means of transport: for aeroplane the flight number, for vessels the ship name(s), for railways the train identity and wagon number, for road transports the registration number plate with trailer number plate if appropriate. In the case of ferry, indicate vessel and road vehicle with the identification of the road vehicle and of the scheduled ferry. Box 18: Declaration of control authority or control body issuing the certificate. The signature and the stamp must be in a colour different to that of the printing. Box 19: Shall be filled in by the relevant Member State’s competent authority or by the importer. 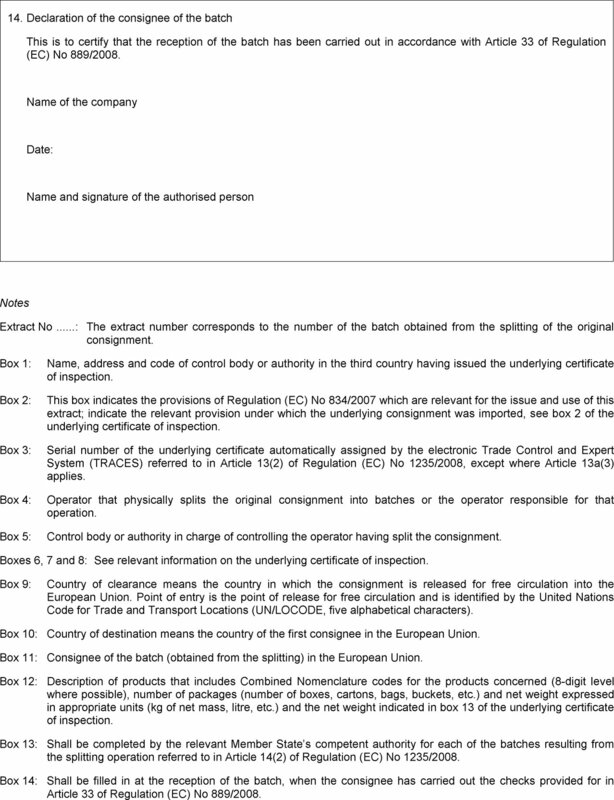 Box 20: Shall be completed by the relevant Member State’s competent authority, if appropriate, before the preparation or splitting operation in the circumstances referred to in Article 14 of Regulation (EC) No 1235/2008 and at the verification of the consignment in accordance with Article 13(1). Box 21: Shall be filled in by the first consignee at the reception of the products, when he has carried out the checks provided for in Article 34 of Regulation (EC) No 889/2008. 13. Declaration of the relevant Member State’s competent authority endorsing the extract of the certificate. This is to certify that the reception of the batch has been carried out in accordance with Article 33 of Regulation (EC) No 889/2008. Extract No : The extract number corresponds to the number of the batch obtained from the splitting of the original consignment. Box 1: Name, address and code of control body or authority in the third country having issued the underlying certificate of inspection. 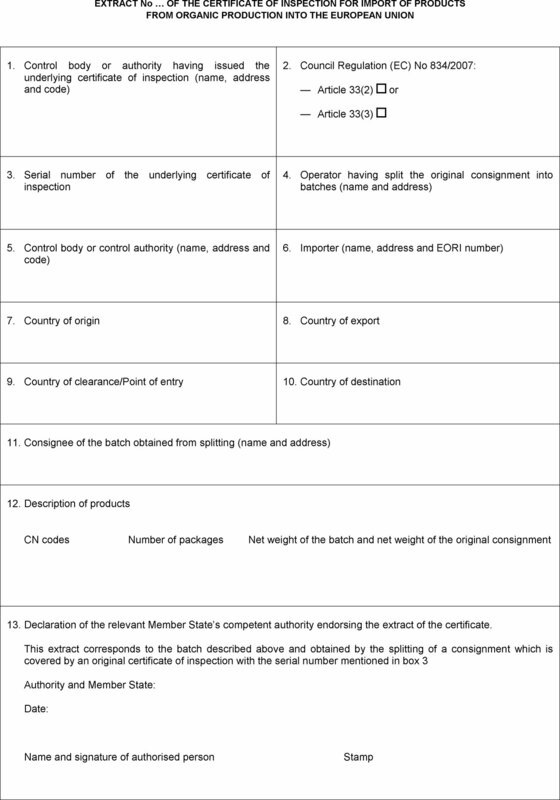 Box 2: This box indicates the provisions of Regulation (EC) No 834/2007 which are relevant for the issue and use of this extract; indicate the relevant provision under which the underlying consignment was imported, see box 2 of the underlying certificate of inspection. Box 3: Serial number of the underlying certificate automatically assigned by the electronic Trade Control and Expert System (TRACES) referred to in Article 13(2) of Regulation (EC) No 1235/2008, except where Article 13a(3) applies. Box 4: Operator that physically splits the original consignment into batches or the operator responsible for that operation. Box 5: Control body or authority in charge of controlling the operator having split the consignment. Boxes 6, 7 and 8: See relevant information on the underlying certificate of inspection. Box 11: Consignee of the batch (obtained from the splitting) in the European Union. Box 12: Description of products that includes Combined Nomenclature codes for the products concerned (8-digit level where possible), number of packages (number of boxes, cartons, bags, buckets, etc.) and net weight expressed in appropriate units (kg of net mass, litre, etc.) and the net weight indicated in box 13 of the underlying certificate of inspection. Box 13: Shall be completed by the relevant Member State’s competent authority for each of the batches resulting from the splitting operation referred to in Article 14(2) of Regulation (EC) No 1235/2008. Box 14: Shall be filled in at the reception of the batch, when the consignee has carried out the checks provided for in Article 33 of Regulation (EC) No 889/2008.